Last year, I grew mustard greens for the first time and loved them, so I'll do more of those, too. What I learned about leaf veggies (although too late for last year): If I cut them off a few inches from the ground, most of them will grow back! And that includes beet greens. Cool. Inside, I'm starting tomatoes (an Amish paste I discovered last year for sure), Barker's X-Hot chile seeds from my Left Coast Crime goodie bag, pumpkins, and basil. 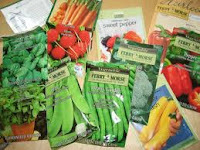 What I learned about germination: Many of last years leftover seeds are viable for years, so I don't have to buy new ones - beets, radishes, cukes, tomatos, lettuce are a few. There's something magical and soul strengthening about growing what I eat. Especially in these disturbing days of economic turmoil. Not to mention unknown chemical agents and who-knows-what. You can join in, too. If space is limited, plant in pots. I've heard you can even grow a garden in a hay bale! That eliminates all the digging. And of course, you can always support your local growers by shopping at the farmers markets. 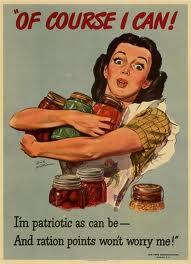 Heck, I might even try canning this year. So tell me what your plans are. What's growing in your garden? Are you trying anything new? Deb, you are certainly right. There is something magical and special about growing your own garden. I have learned so much over the years growing my garden. I am 29 years old and have been growing and canning for almost 6 years now and you know it is crazy because I am the only one amongst my age of friends that actually do this. I even talk with people much older than me and they don't and have never raised a garden. I grow a lot of tomatoes, green beans, peppers, okra, cabbage, broccolli, brussel sprouts, squash, cucumbers, potatoes, sweet potatoes and we try something new each year. This year we are going to grow some turnips. sprinkling lime on the ground near your tomatoes make the tomatoes sweeter, chalk dust on your cabbage will help keep the bugs away from them, each year plant each vegetable in a different area, throw your scraps in the garden along the rows of your vegetables, epsom salt around tomatoes helps prevent diseases. That is all I can think of for now, I will keep you posted if I think of anymore. I look forward to hearing everyone else's tips. I absolutely love gardening and love to share my gardening experiences. We have a small garden every year. Usually we grow cucumbers, yellow squash, bell peppers, okra, eggplant and tomatoes. We try to add a different thing to try. Last year it was brussel sprouts and did not have any luck with those. This year we may try broccoli and probably purple hull or crowder peas. We grow marigolds around the garden edge as they help keep bugs off the plants. We also belong to a garden delivery co-op run by two local organic gardners. We get spinach, leaf lettuce, corn, tomatoes, cucumbers, khol robi, bok choy, collard greens, turnips and greens, green beans and other things. Oh, one of the farmers has free range chickens and I get eggs from him year round. So nice to get fresh local chemical free veggetables. Chickens are not given hormones or antibiotics either. Looking forward to getting our garden planted this year. We have already worked on layout and now will begin looking for the seeds and plants to put in it. No green thumb here:( I just go to the local farmers market to support them. No green thumb here as well, but I do enjoy buying produce from the farmer's market. Love the support to local farmers! Tiff, great tips. And Laura, I have to look up purple hull since its new to me. A garden club member told me about lasagna composting right in the garden. Throw in a layer of scraps, then a layer of shredded straw or leaves, and a little soil. Repeat. No carting from a compost bin and turning is much easier. Dave is the gardener in our household. Last year he started the tomato plants indoors too early so he's waiting longer this year. Mainly we're weekly visitors to a couple farm stands in the area. Actually, you don't want to use hay, you want to use straw bales. Hay bales have seeds in them that tend to germinate. I'm waiting for the rest of the snow to finally melt and the ground firm up so I can pull up my old raised garden and put in a new one. If container planting, plant more than one thing in a big container- something tall in the back, short in the middle and something that has vines in front and grows over the side. We have been putting in a garden for the last three years and it's gotten so big, we decided to make the current veggie garden into a wildflower garden and moved to a new space that used to be a sand volleyball court in our back lawn. The previous owners just put sod and grass over it which doesn't grow as any moisture just goes on through. So we are putting out our compost we've been generating...DH says it looks like a herd of elephants has pewped in our yard...and we will start putting out top soil and more manure or some such until it's time to till the soil and plant. DH is starting peppers of all kinds, cayenne, anaheim, and others and then some tomato seeds. The spare bedroom is our nursery for these little plastic cups/hothouses. We grow corn because we like how it looks when it grows, tomatoes, peppers, and we have had feral pumpkins come up. Vickie, I love the world of chile peppers! And I'm so addicted to composting! All my veggie scraps, egg shells, teabags, and coffee grounds go into the garden along with shredded leaves. I do container gardens. My new plants this year will be garlic and rosemary. I've kept a thyme plant going three years and want to do that with more herbs,so as to have more fresh herbs next winter. I do lazy gardening by buying my plants at HD,but it's still fun. No garden but I love baked potatoes (which could grow in a garden, except they wouldn't be baked). No garden, no balcony, not enough sun reaches my back space due to higher flats blocking the sun. I am not a fan of cooking either, and as a child my parents had a huge garden, so had to help with the harvesting and the cooking/freezing for hours and hours. Enough for a lifetime. But if you like a little garden, growing vegetables is fun.I did have a tomatoplant last year, and shared them faithfully with my parrot, who loves tomatoes. Deb: My family calls me the compost police. I am especially bad when we gather at my dad's each June. My sister shakes her head when I blurt out, 'Wait! That goes...' when my nephews start to throw a banana peel in the trash. "Yes, Auntie V, we know! We're sorry,"
I take a ziploc baggie to the restaurants for leftover fruit when we go out to breakfast. DH puts up with it, just like my habit of checking the coin drop in vending machines and phone boxes.